A new quick service restaurant has hit the streets in Disney World’s Hollywood Studios, with the wise-cracking Muppet, Rizzo the Rat, as the owner! 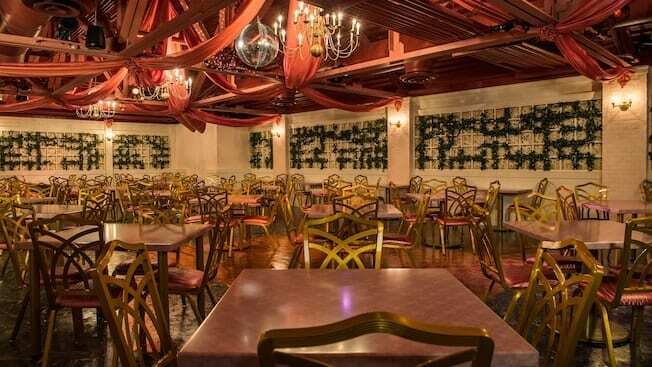 Check out these 6 things you’ll want to know about PizzeRizzo before making dining plans at Hollywood Studios. November 18, 2016 hit and the doors of PizzeRizzo opened in the former Toy Story Pizza Planet restaurant which has now been transformed into a classic family pizzeria. Located in the Muppet Courtyard just steps from the beloved attraction, Muppet Vision 3D – we were especially pleased to see this quick service restaurant addition with the recent closures and refurbishments underway at Hollywood Studios. The construction has Muppet Courtyard cornered in its somewhat isolated location, but folks are still making their way to PizzeRizzo to see what this new restaurant is all about. Sit back and feel like you’ve joined the Rizzo Italian family. 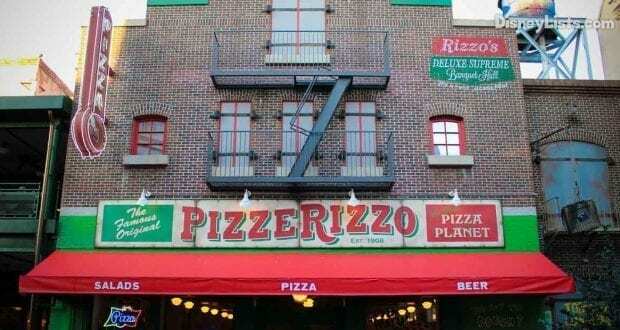 As you approach PizzeRizzo, you’ll immediately feel as if you’ve been transformed to the streets of New York with street lights, metal poles, fire escape, and a faded red and green PizzeRizzo pizza joint exterior – including the typical curtains in the windows, neon lighting, and paper menus and flyers plastered at the entrance. Once inside, you’ll spot the exposed brick walls, pipes lining the ceiling, and classic pizza joint style booths and tables. Indoor and outdoor seating is available, plus a second-floor banquet hall welcomes guests. This banquet (Rizzo’s Deluxe Supreme Banquet Hall) invites guests to join a wedding reception already in progress with a disco ball and party playlist! Since PizzeRizzo is a quick service restaurant, you can walk in expecting to stand in line at one of the registers to place your order – just like a typical quick service ordering experience at Disney. Screens above present the menu so you can easily decide what you’d like as you wait in line. With multiple registers and windows for food to come out of, the lines do move rather quickly. Snag your food and drinks then head to a table. It really is a free-for-all, but we’ve noticed upstairs is typically less crowded than downstairs or outdoor seating. With a simple lunch menu, the food and variety at PizzeRizzo is somewhat limited. You can select from one of their personal-sized pizzas (four small slices) which include cheese, pepperoni, vegetable and meat lovers. Served with each pizza is a small, cup sized Caesar salad. 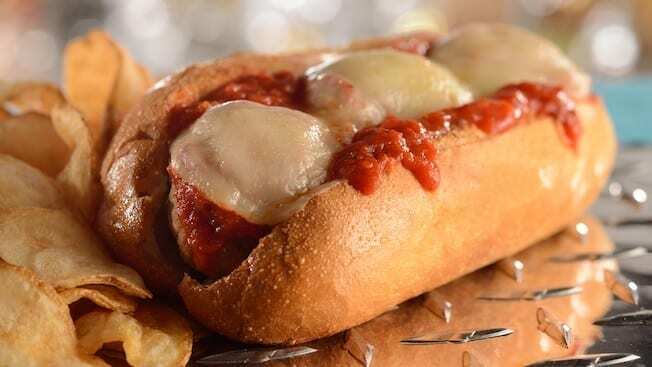 If you aren’t in the pizza mood, you can order a meatball sub (also comes with a Caesar salad) or an Antipasto salad. All entrees are under $11. Two of the kid’s meal options are a cheese pizza meal or a mini chicken sub meal – both include applesauce, carrot sticks and a drink choice. There is also a kids’ Mickey Check Meal Power Pack. The power pack has yogurt, apple wedges, carrot sticks, Goldfish crackers, apple-cinnamon snack bar and milk or water. Wrap up your meal with one of the two desserts (or just order both!) – a tiramisu and cannoli. To be honest, the food here is well – quick service pizza food. 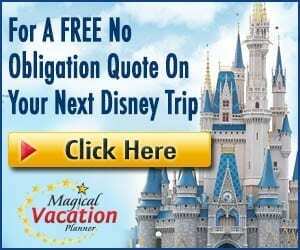 It’s a simple hold over until you have a chance to taste what Disney really has to offer in Italian food – such as at Tony’s Town Square Restaurant at Magic Kingdom. We did find the desserts tasty! We were pleasantly surprised and pleased with the variety of drinks available at PizzeRizzo! With more drink options than food options, guests can enjoy non-alcoholic and alcoholic beverages. The non-alcoholic drinks are the typical fountain sodas, as well as coffee, hot cocoa, hot tea, and a Peach Bellini. Wild Berry-Basil Limoncello Lemonade, Moretti Blond, Bud Light, and Birra Moretti Biere Blonde Lager are available for alcoholic beverages. Drink up! While we might not be singing praises about the food at PizzeRizzo, it is exactly what we expected from the quick service spot and we will likely dine there in the future. It’s an easy spot to spread out and eat with tons of seating and a choice of eating indoors or out. We also found it’s a great place for kids because they love the food and they can talk at their own volume level without you having to hush them! So, with a drink from the adult drink selections, air conditioning surrounding us, and kids chowing down on their beloved pizza – it’s a win when needing that break in the park. 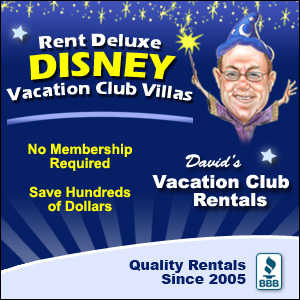 And did we mention, the meals are fairly cheap for Disney standards and the Dining Plan is accepted. Have you had a chance to dine at PizzeRizzo? We’d love to hear about your experience! Editors note: Be sure to check operating hours before your visit, as operating times are seasonal. This restaurant may only be open for lunch from 11:00 am – 4:00 pm.